Ilul Farid Mohamed Zalhoud gh useggwas n 1959 gh Waday ilan gh tseggiwin n Tefrawt. Ar isseghra tafransist yeg iggi n uya amedyaz d unazûr. Ar ghilad yiwes gh kigan d twuruwin izdin d usnulfu amazigh, mkan af yumêz aseggwas n 1997 Atig n Said Sifaw, d watig agraghlan n Abdelkrim El Khattabi ittuzêlayen i usnulfu gh useggwas n 2000 d win tmesmunt Tamaynut izêlin i isnulfu amazigh gh useggwas n 2001. Gh tama n timedyazin yara Farid Mohamed s tmazight zun d Imerruyen, Takad d Ighd (ittqlen ad ffaghent), ar ittara dagh tamedyazt s tefransist, Paroles de Paria ad yegan tadla nnes tamezwarut s tutlayt tafransist. Farid Mohamed Zalhoud est né en 1959 à Aday, Tafraout, Maroc. Il enseigne la langue française, est poète, peintre et sculpteur. Il a obtenu trois prix littéraires. En 1997, il a reçu le prix Saïd Sifaw. En 2000, il obtient le prix du jeune créateur du Grand prix international Abdelkrim Khattabi, en 2001, le prix Tamaynut. Il a composé une trilogie poétique en amazigh intitulée : Imerruyen, takad, ighd (Étincelles, feu, cendres, en attente d'édition). Parole de paria est son premier recueil en français. Farid Mohamed Zalhoud was born in 1950 in Aday, Tafrawt in Morocco. A French language teacher, he is also a poet, a painter and a sculptor. He is the recipient of three literary prizes: the Said Sifaw prize in 1997, the Abdelkrim Khattabi International Grand Prize for Young Creator in 2000, and the Tamaynut Prize in 2001. His poetic trilogy in Amazigh titled Imerruyen, takad, ighd (Sparks, fire, ashes) is pending publication. 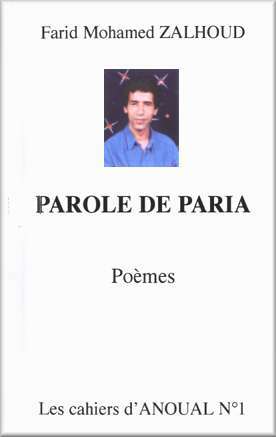 “Words of a Pariah” is his first collection of poems in French. © Association Anoual. Tous droits réservés.